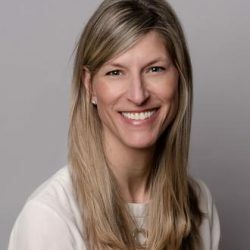 Jennifer received her Honours Bachelor degree of Kinesiology with a minor in Gerontology from Lakehead University in 1996 and her Bachelor of Science in physiotherapy from the University of Toronto in 2000. Upon completion of her degree she continued her studies in the area of Manual Therapy. In recent years Jennifer has advanced her professional career in pelvic health. After becoming a mom of 2 she had a special interest in helping woman with pelvic health pre-natal and post-partum. She has been trained to use internal and external manual techniques to evaluate the function of the pelvic floor muscles. Using her manual therapy and pelvic health knowledge she helps get moms back to health. In her free time Jennifer enjoys spending time with her husband and two children Liam and Hunter. As a local mom, you often will find her at the nearby soccer field, ski hill or hockey rink! Jennifer is available at our Bloor West location.